After Texas’ series win over sixth ranked TCU to open conference play, let’s play a little good news bad news. AUSTIN — On Thursday, head coach Augie Garrido said that his team avoided “the weird” in their win over the TCU Horned Frogs. The Texas Longhorns avoided “the weird” again on Friday, taking game two over the Frogs 2-0 in a game that lasted only two hours and 14 minutes. AUSTIN — Before this game, TCU’s starter, Luken Baker, had yet to receive a loss in his collegiate career. He was a part of a staff that had combined for a 2.78 ERA and an opposing batting average of .225. Baker had two things going against him tonight, his defense behind him and sophomore outfielder Patrick Mathis’ bat. TCU’s four errors and Mathis’ two-run home run in the fifth helped the Texas Longhorns go on to win their Big 12 Conference opener, 4-3. AUSTIN — Without diving into details, the Texas baseball team’s 2016 campaign has failed to meet its basic goals. Now, Big 12 play begins. 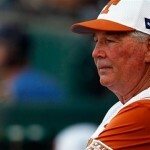 With high expectations at the beginning of the season for head coach Augie Garrido, the Longhorns have stumbled out of the gate. 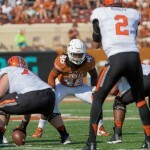 Wednesday, after the Longhorns’ second spring football practice, the media was allowed to catch up with players who possessed leadership roles on the team. Senior offensive tackle Kent Perkins, senior tight end Caleb Bluiett and sophomore linebacker Malik Jefferson were all made available for questions. After a disappointing four game sweep at the hands of Cal, the last thing Texas could afford to do was lose a fifth straight game to the visiting Sam Houston State Bearkats days before embarking on their first true road trip. 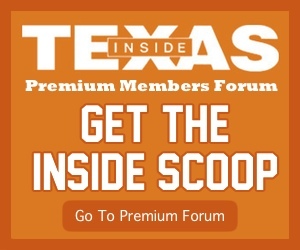 The combined effort of the entire starting lineup and sophomore starter Morgan Cooper made sure that did not happen as Cooper’s six scoreless innings boosted the Texas Longhorns to a 12-3 victory. SAN MARCOS — After allowing the Texas State Bobcats to tie the game with two home runs, the Texas Longhorns exploded for six runs in the 11th to defeat the Bobcats, 10-4 in San Marcos. Through four innings, Texas only had two hits on four hard hit balls. 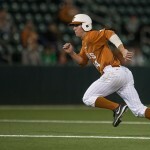 They advanced a runner to second in the first after junior center fielder Zane Gurwitz reached on an infield single. After being moved on a sacrifice, Gurwitz failed in his attempt to steal third with two outs. AUSTIN — The No. 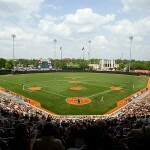 23 Texas baseball team pounded out double-digit hits for the second straight game and kept UNLV off the board for the entire afternoon en route to a 7-0 shutout win in the series finale at UFCU Disch-Falk Field on Sunday. Watching the first three innings would make you think that the 2016 Longhorns had turned the corner on offense and would be able to support the pitching staff with timely hitting, moving runners over, and aggressive base running.